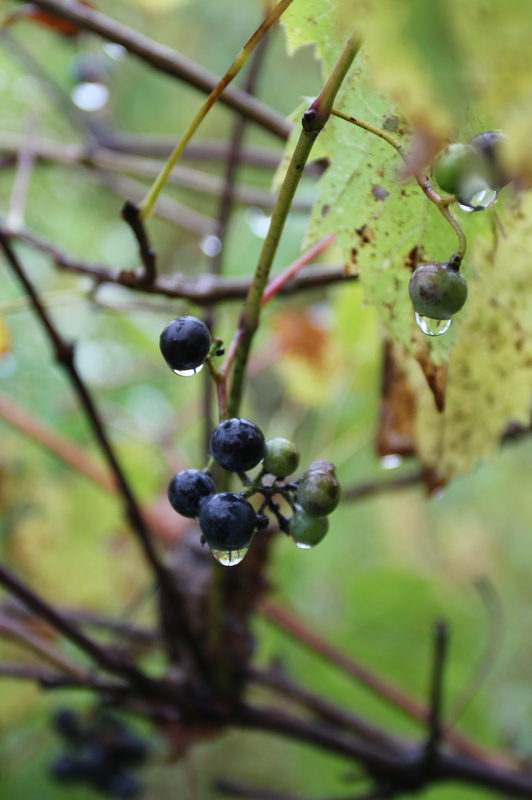 You can find wild grapes growing all over: from forests to fields to urban streets. I found a huge vine growing up a fence just a block away from my urban apartment. They look very similar to to store bought grapes, but are a lot smaller, with fewer grapes per bunch. The size of the grapes themselves is closer to that of a blueberry. You can recognize them by the vine, which looks just like a commercial grape vine (or so similar it is easy to recognize.) You can even eat the leaves and curly vines of this plant. The leaves are great for making middle eastern style stuffed grape leaves. Wild grapes growing on a vine in late summer. 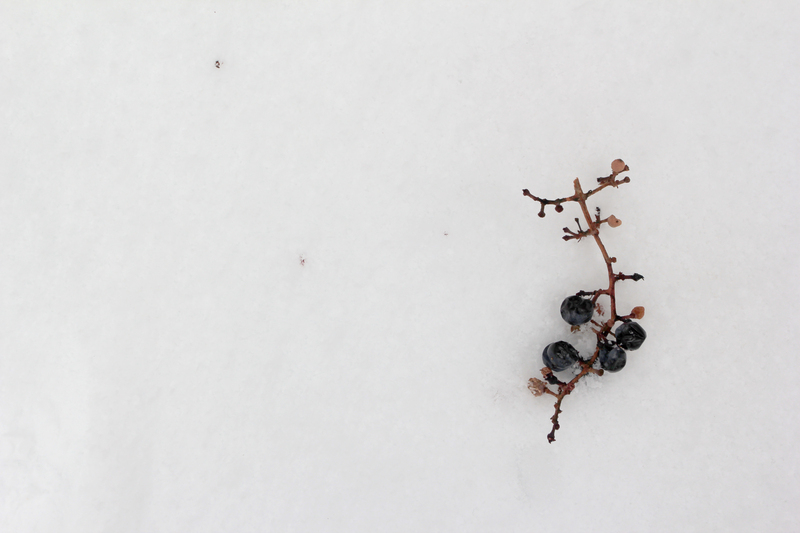 Wild grapes themselves are small and tart. They can be eaten straight off the vine, but the large seeds in them make it a pain, and their sourness does not make it very enjoyable to eat a lot of them. Processing the grapes to use their juice is an easier way to enjoy a large harvest of these wild purple orbs. This recipe starts with a basic juice recipe, and then turns that into jelly. If you find you like the tart juice, you may want to set some of it aside to drink. Thoroughly wash the grapes. Pluck them from the stems and sort them to remove debris. Once they are de-stemed and rinsed, put them in a large stock pot with the 2 cups of water. Bring to a boil. Reduce heat and simmer, allowing the grapes to cook down until all of the grapes have burst and you only have seeds, skin, and juice left in the pot. Remove from heat and allow the mixture to cool. Once cooled use a strainer or colander to separate the juice from the skins and seeds. Press down gently to remove the access juice, then discard the skins and seeds. Filter the juice by pouring it through a jelly bag or cheese cloth folded over (jelly bag works best). After this step you can allow the juice to sit in the fridge for a few days, or start right in on the jelly. To make the jelly, prepare you canning jars and lids in a boiling hot water bath. If using the measurements in this recipe, you will fill about 5 half pint jam jars. Take a wide stock or sauce pan and measure out 2 Tbs pectin into 3 cups of grape juice. (These measurements can be multiplied to use your remaining juice). Bring to a boil. Add in 4 cups of white sugar and stir until the sugar combines. Return the mixture to a boil, and once it has been held at a rolling boil for 1 minute, remove the pot from the heat and fill the sterilized jars. Leave a 1/4 inch of head space. Process in a water bath canner for 10 minutes, or store immediately in the fridge. Let the jelly cure for up to a month to develop the best flavor. 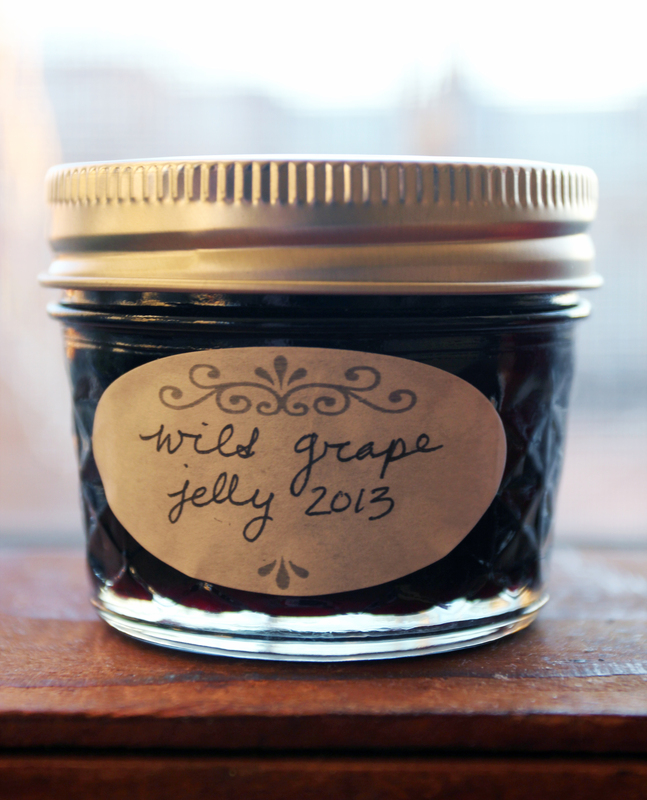 The wild grapes give this jelly more depth of flavor than traditional grape jelly. Enjoy a you would any other jelly or jam.